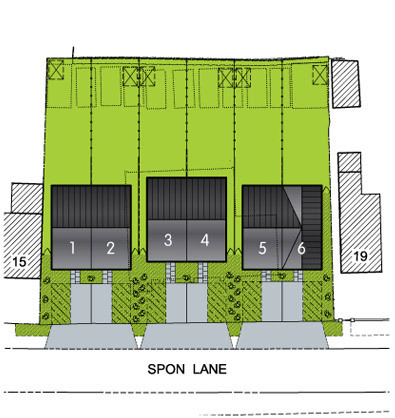 Each home is nearly 1000 sq ft.
Each home has 2 off street car parking spaces. Outside, a choice of 2 colours. 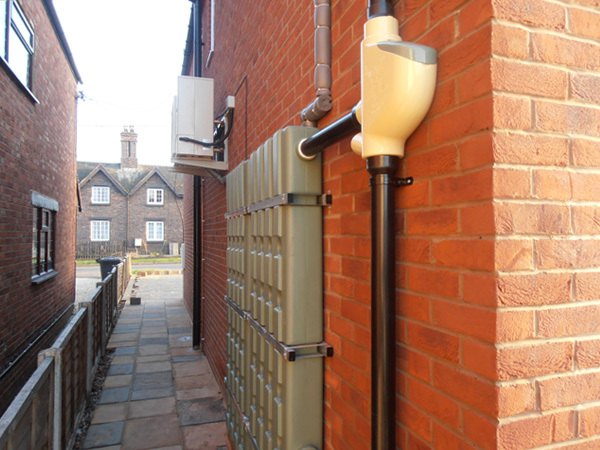 Each home comes with full wheelchair access. 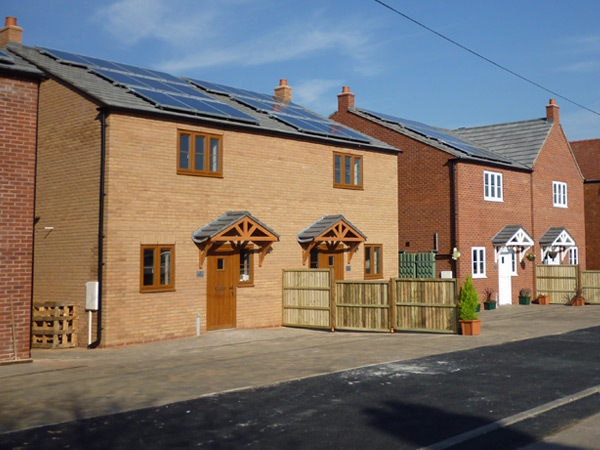 Situated on a quiet residential cul-de-sac in Grendon, Atherstone. 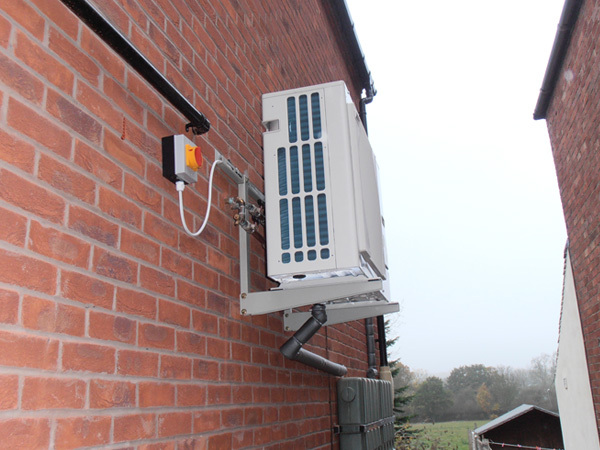 The Air Source Heat pump – so you never have a gas bill again. 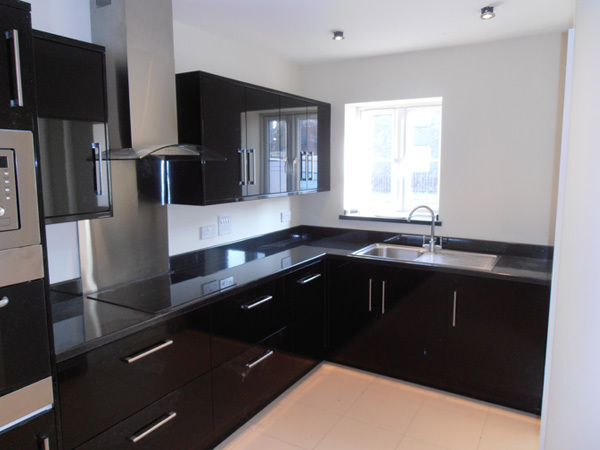 A choice of 2 kitchen styles. 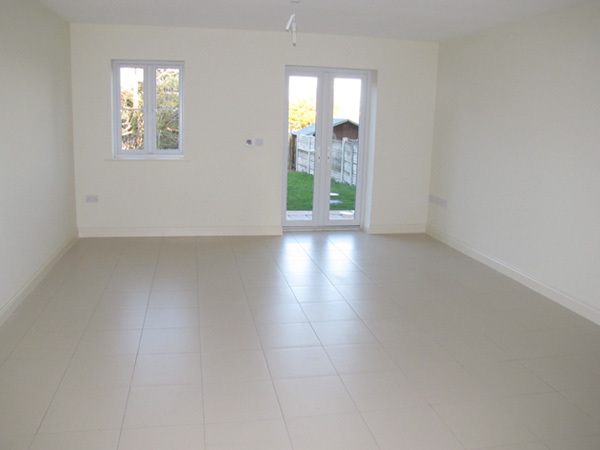 The large lounge-diner with underfloor heating, leading to the garden. 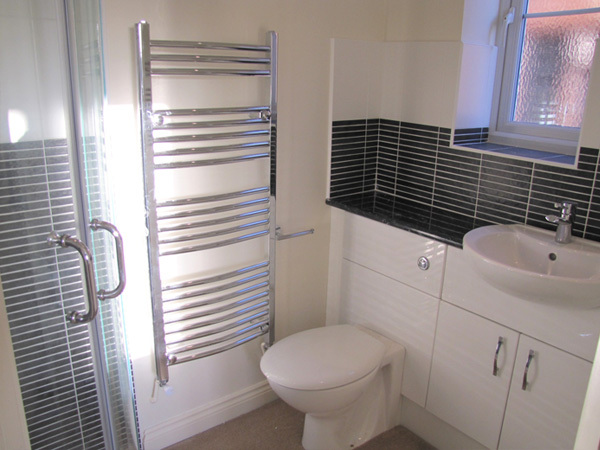 Upstairs family bathroom with eco taps. Master Bedroom built in storage. Upstairs Landing. 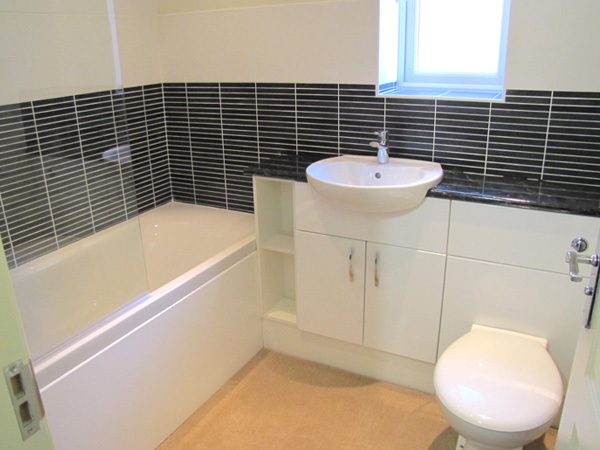 Showing the 2 back bedrooms and the upstairs bathroom. A garden over 50 feet long. 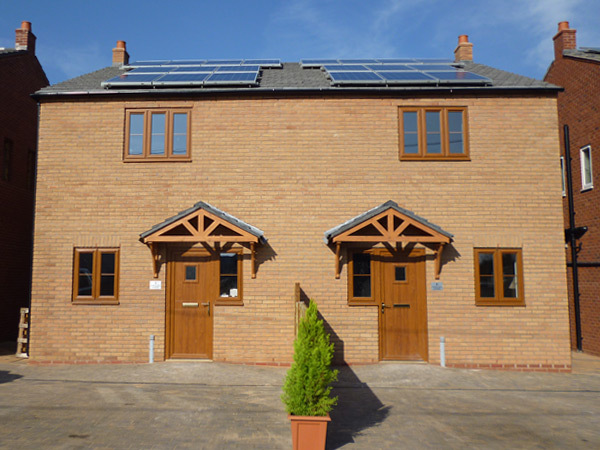 Each home in Church Hall Gardens is semi detached and covers nearly 1000 sq ft. The ground floor offers a large kitchen with its own breakfast area, a WC and lounge-diner that leads, via French doors, on to a 50 ft lawn garden. 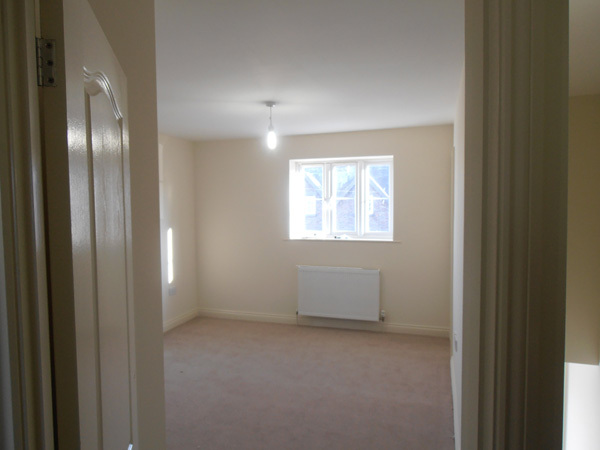 Upstairs are three bedrooms, with the master bedroom having its own en-suite. 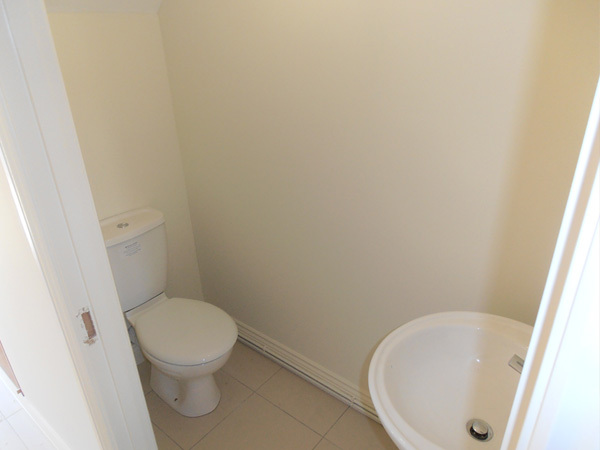 There is a large family bathroom and two further bedrooms at the rear of the house. At the front of the house there are two off-street car parking spaces for each property and a side entrance to the garden. Beam and block floors by Stressline with 75mm Celatex floor and 65mm concrete screed. Sanitary Ware to be white Porcelanosa with water saving design incorporated lo cloaks, ensuite and bathroom. 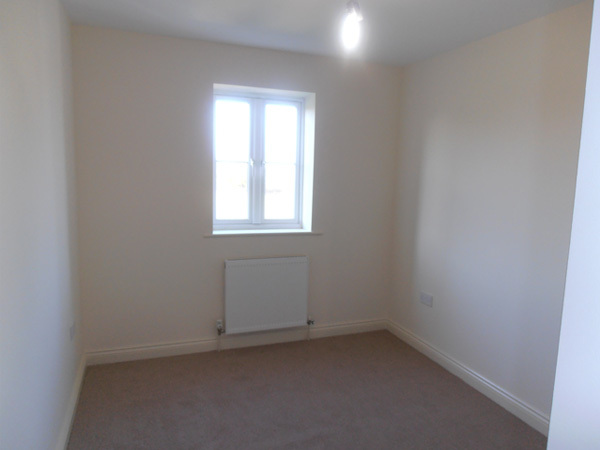 All rooms to have 2 or more 13 amp socket outlet with low energy lighting to all rooms with white plate covers. Telephone points to lounge, hall and bedrooms 1 and 3. 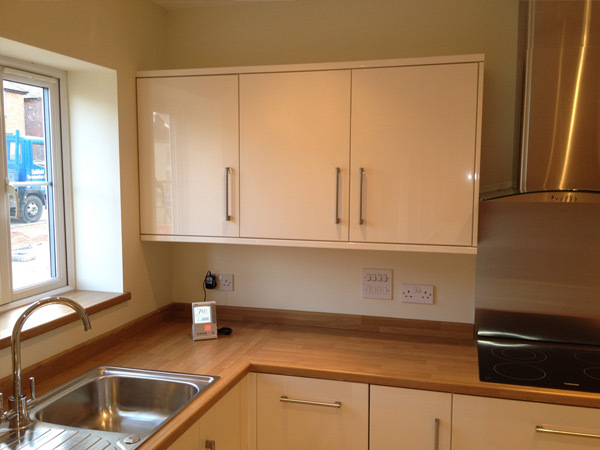 Fitted kitchen units will have built in appliances that will all be at least ‘A’+ rated, to ensure efficient energy use. 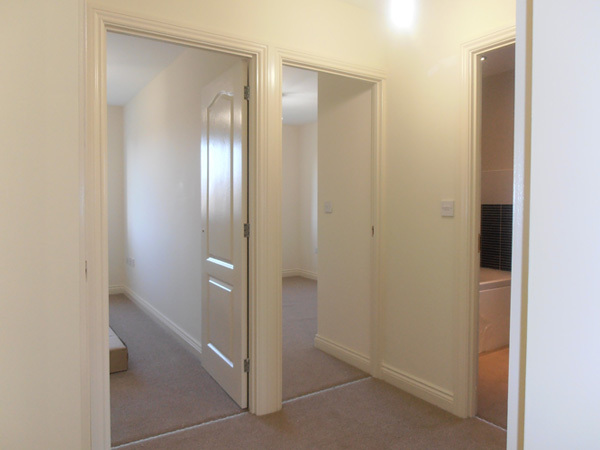 Joinery MDF architrave and skirting with John Carr classic design doors or similar. 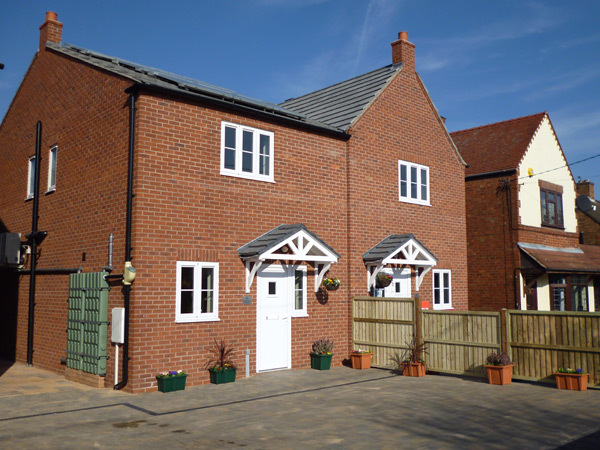 Plots 1, 2, 5 and 6 are multi red brick, Plots 3 and 4 are buff colour brick. Double glazed units throughout. These will incorporate float glass and Planethern with aluminium spacer bars. Internal, external walls Thermalite Turbo block 100mm cavity fill by Isotherm High Cavity Insulation, to ensure minimum heat loss. Walls and Ceilings to be plastered and receive two coats of emulsion. 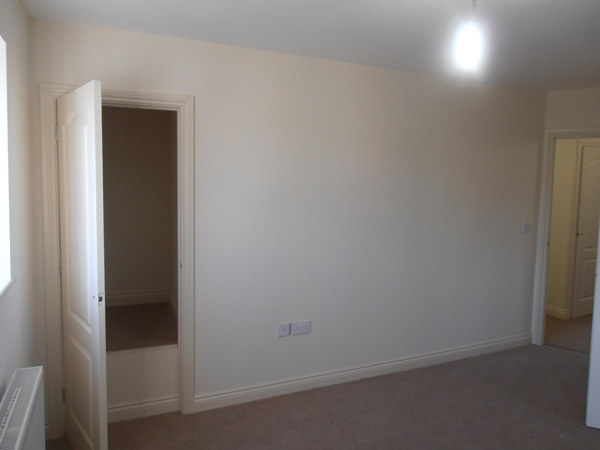 Central division walls built to robust detail with 100mm Isothern Sound Insulation. RoofTrusses by Truss Form over laid with breathable felt and flat pan tiles by Marley or similar. Shiplap fencing to demark boundaries and 6' x 8' garden shed and clothes dryer. Front driveway to be blockpaved and patio to rear elevation to be paving slabs. 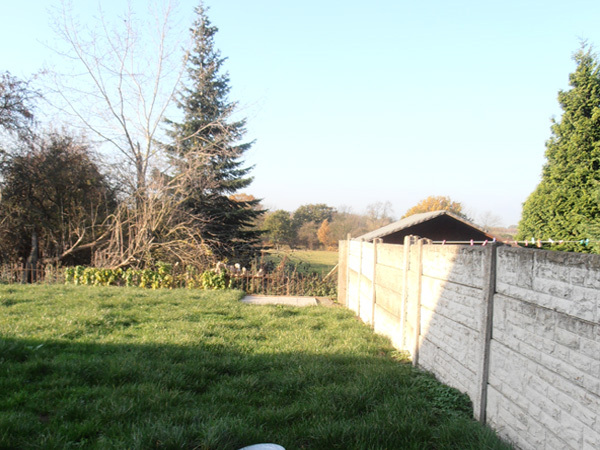 Rear garden top soiled and grass seeded. 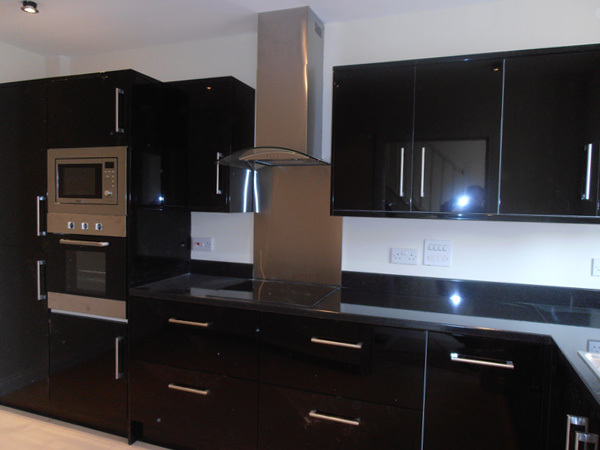 All properties are backed up by a 10 year Premier new build guarantee, to give you extra piece of mind. 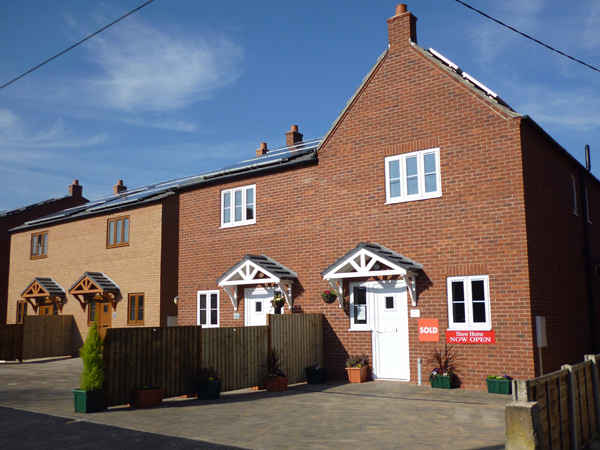 Set in a semi-rural location, this development is perfectly placed on a quiet residential cul-de-sac in Grendon, Atherstone, between Nuneaton and Tamworth in the West Midlands. 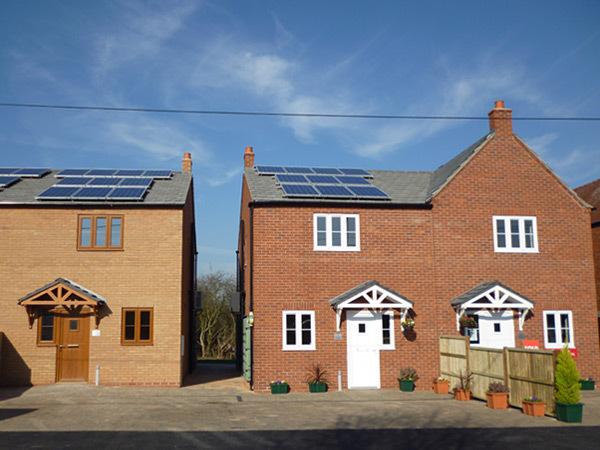 With the beautiful North Warwickshire countryside as its backdrop and J10 of the M42 conveniently close, you achieve the best of both worlds with this exciting eco-home development.